Okra bahmia (Abelmoschus esculentus) plant is considered as one of the abundant sources of natural fibers. Huge amount of okra plant stem is discarded on the field annually after collecting vegetable, without proper utilization. However, this biomass from the okra plant is a renewable, biodegradable, cost efficient and low-density source for production of bast fibers, and other industrial cost-efficient eco-friendly materials. The research on okra bast fiber has started in 2007. After that, the fiber extraction process, composition of fiber, morphology and performance properties of fiber, fiber modification techniques, and some important applications of the fiber etc. have been established. It was found that the okra bast fiber contains high cellulose content, excellent mechanical strength and stiffness, and good thermal resistance which are comparable to some traditional bast fibers like jute, hemp and ramie. Some okra bast fiber reinforced biocomposites were successfully fabricated with different matrices including biodegradable corn starch, Poly(lactic acid), P(vinyl alcohol), urea formaldehyde resin etc. via application of various processing methods. 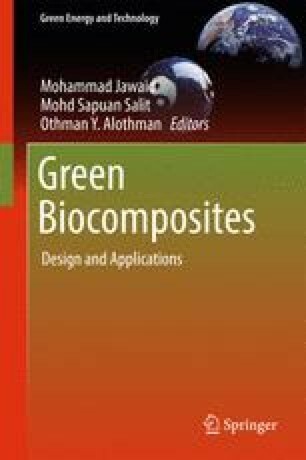 These studies revealed that the okra bast fiber biocomposites exhibited better mechanical properties, water resistance and thermal properties at optimized processing conditions. Therefore, by suitably optimizing the fiber, matrix, processing conditions, the future expectations of the okra bast fibers can be dramatically enhanced and its usage in composite field can be widened.